A couple days ago, some folks stopped by. They’re not from around these parts, as the saying goes, but they’re looking for property in the area, and are having a heck of a time finding a place that meets their needs. Or fits their expectations. Which of course are not necessarily the same thing. Anyway, it seems as if every property they’ve looked at involves compromise in one form or another. It got me thinking about how we landed here. Which, I have to say, was pretty much by default. 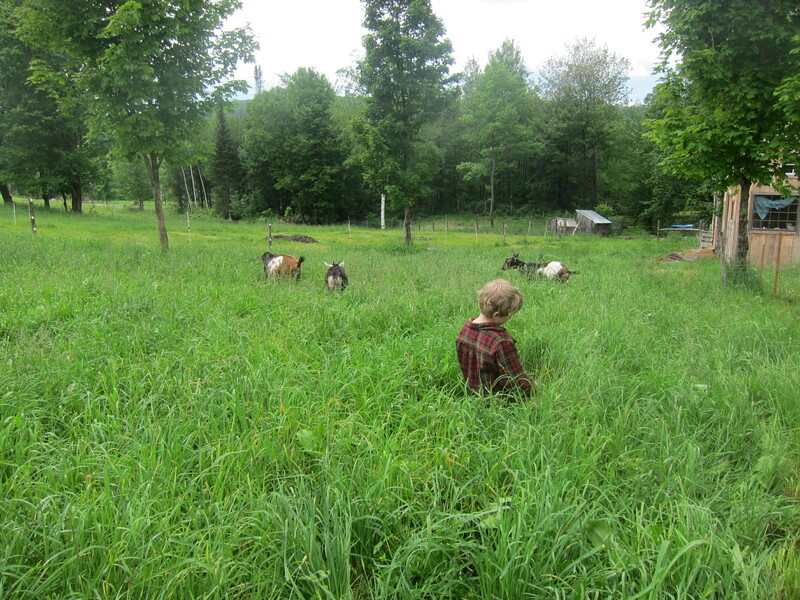 We’d been looking for land for a year or more, and it had been a rather dispiriting process, what with our meager resources (we had all of $15k to our names) and our desire to inhabit a piece of land suited to small scale growing and general romping about. This was 16 years ago, so $15k wasn’t as meager as it sounds today, but still… it weren’t terrible much even at the time. As such, Penny and I kept getting dragged across one sopping wet 5-acre cedar swamp after another, with realtors babbling on about “potential” and “promise.” Yeah, right, whatever. Anyhow, after a solid 12 months of this, we stumbled across a for-sale-by-owner ad in one of those free local papers that’s mostly ads for used car dealers and Dunkin’ Donuts promotion-of-the-week. The land advertised wasn’t in one of our towns of choice, but the description was compelling, and the price was exactly on the outer limit of what we could afford with the 50% down payment banks typically require for bare land purchases. As I’ve written before, we made an offer the same day we looked at it. What’s interesting to me is how many of the aspects of our property that we first perceived as deficient, have become beloved. The hills, for instance: Our entire property slopes westward, with hardly a piece of ground level enough to accurately check the oil in our car. It is true that for optimum efficiency in growing, flat land would be preferable. But the sloping and undulating nature of our land has become one of our most-favorite things about it. There is a sense of energy to it; it is dynamic and flowing, with little hummocks scattered about so that there is always a view that can’t quite be realized from wherever one stands, but is near enough to being revealed that it beckons you forward. These same characteristics – slope and undulations – also mean that our property is home to numerous microclimates, which we are slowly learning to leverage for growing species that are not entirely suited to this region. This summer – thus far one of the wettest, if not the wettest, on record – we haven’t had to deal with any flooding, because once the soil becomes saturated, the pitch of our land carries the rain water into the valley below. Every day, I hump it up the hills of our pasture carrying bags of chicken feed, or reels of fencing, or a chainsaw, and I feel my heart thumping and the sweat on my brow, and I know I am lucky for the effort, that it may end up adding years to my life. Either that, or I’ll drop dead of a heart attack in our pasture someday. Which wouldn’t actually be such a bad way to go; Penny and the boys could just dig a hole on the downhill side of me and give a little shove. I could go on, but I suppose my point is this: We did not buy our ideal piece of property. We bought a piece of property that we could afford, and that despite its deficiencies, spoke to us. It wasn’t so much that we walked this land and thought that maybe we could make it work; it was that we walked this land and knew we’d found what we were looking for, despite the fact that it really wasn’t exactly what we were looking for. If that makes any sense. It’s been a decade-and-a-half since we moved onto this land, and I often think about how profoundly this property has shaped our lives in ways that are utterly unique to it. To be sure, we have done our share of shaping – dug a pond, cleared for pasture, built a house – but I suspect the land still wields the greater power. For whatever reason, this is comforting to me. The truth is, the land leads. We just follow. Thank you. The Land Leads. Yes. This is wonderful. Your writing brightens my day, and this in the middle of yet another 90 degree heat wave, working in the fields, sweating my brains out, trying my best to be a farmer at age 56 (57 tomorrow…) I too think maybe this work will help me live longer, or at least with more quality of life. I’d be thrilled however, to be buried right here. I can’t think of a better place on this earth for my final resting place. I didn’t buy my ideal property either. It may be wishing for a different owner…or just patiently training me. Thought provoking! My husband and I bought our land 9 years ago after looking rather desperately for a 1 acre lot to build on. We ended up through a very kind contact with 20 acres purchased for cash at $500.00 per acre….. crazy, isn’t it? Of course it is not perfect, and then again, it is! We’ve put so much of our own labor into it, and we still have a long way to go. I’m not really a “jump into it” kind of gal, so we’ve made improvements slowly, usually with a lot of thought and talk. There is a large garden, with plans for an expansion and a perennial bed, an orchard, chicken house, bee yard, and expanded and improved pond. There is a couple of green patches for harvesting 2-3 deer a year. There are plans for wood burning stove and a pig perhaps this fall? Very little of it is level, but most is usable with terracing and creativity. I’ve been reading your blog archives lately via a recommendation from Soulemama – and I hope to purchase “Saved” soon! I have been enjoying your writing very much, and will go back to my saved issues of Taproot to reread your article (s?)! I to live on a hill and flooding is never one of our worries. We overlook a beautiful Valley that has deep rockless soil. We, on the other hand, have rocks galore…but we have learned to not only deal with them but put them to use in gabions for our fence lines and rock walls here and there to terrace some flat spots. I am a third generation steward of my land and hope that many caring stewards will follow. Your writing is a bright spot in my day as I go about my work with my farm. Hopefully those people will let you know where they end up as I would love to hear the rest of the story. “The land leads, we just follow.” That is good writing, my friend. We have a similar perfectly imperfect piece of property. We named it Grateful Farm and we are, every day. This post is another favorite. Thank you, Ben! My partner and I have been wanting a block of land for many years but prices have increased so much that it is still out of reach for us at this time. Hopefully one day our block of land will choose us when the time is right. Until then, I’ll enjoy reading about others who have achieved this and are enjoying the satisfaction that this type of lifestyle brings. We identified southern Washington County, NY, as the place we wanted to migrate to from Washington D.C. and it took us three years to find a place that suited us. They ain’t growing small family farms on trees, that’s for sure. Interesting how the ‘right’ land seemed to find both us, isn’t it? I, too, searched for a place, not sure whether to look at a house, land, what have you – but I went with how I felt and knew I would know when I found it. After a few false starts, my own place finally revealed itself – and I found I had all the elements that I had always wanted: water, apple trees, woods, and wild medicinals (not that I have any idea yet which is which). It is fun getting to know it and seeing what will ultimately develop, knowing this is only the beginning of what I hope it will become!